Navicular Syndrome is chronic forelimb lameness associated with several structures inside the hoof capsule. Navicular Syndrome has long been thought of as a single disease process however, it is actually caused by several different closely related structures including: the collateral ligaments of the navicular bone, the distal sesamoidean impar ligament, the navicular bursa, the deep digital flexor tendon, or the navicular bone itself. This explains why “navicular horses” present so differently and why treatment options are so varied with varying degrees of success. Because Navicular Syndrome is actually several diseases and not a single disease, proper diagnosis is extremely important. Because of the complexity of Navicular Syndrome management can be challenging. Clinical signs are little help in securing a correct diagnosis. In other words a veterinarian cannot “watch a horse travel” and diagnose Navicular Syndrome. I have seen horses present with Navicular Syndrome as young as 3 years of age and as old as 20 years of age. The typical horse is 7 to 9 years of age and in the prime of its working life. The classic “navicular horse” presents with a history of an insidious onset of loss of performance, shortening of stride, or shifting bilateral forelimb lameness. Many horses however, present with acute unilateral forelimb lameness. Many owners and even trainers report “shoulder lameness” because of a shortened stride. True shoulder lameness is rare in the adult horse; horses with shortened stride usually have pain in the hoof. Lameness is often associated with change in ownership, management changes, farrier changes, altered periods of turn-out, or increased work load. Lameness may become apparent after a period of enforced rest from an unrelated problem or seasonal layoff. Horses with Navicular Syndrome may “point” a toe while at rest. This is a variable finding and should not be over interpreted as many normal horses will habitually stand with one foot extended forward. Lameness is sometimes apparent when the horse is moving in a straight line on a hard surface, or may only be observed on the lunge with the affected limb on the inside or outside of the circle. Some “navicular horses” have a tendency to stumble. In some horses lameness may only be detected while being ridden. I prefer to diagnose lameness without a rider when possible because a rider can bias diagnostics. Some horses with navicular pain will be sensitive to hooftesters, flexion of the lower limb, and/or the reverse wedge test. Most horses however are negative to these tests. That leaves response to diagnostic nerve blocks and diagnostic joint blocks as the most reliable diagnostic tests. Diagnostic nerve blocks consist of infusion of mepivacaine around the palmar digital nerves to temporarily numb specific structures of the limb and to assess the response. If a lame horse is sound when the back half of the foot is numb than we know the pain is coming from the back half of the foot. A horse with chronic navicular pain may show lameness in the opposite limb once the primary limb is blocked. We can infuse mepivacaine into the distal interphalangeal joint (coffin joint) or the navicular bursa and assess the response. If infusion into the coffin joint blocks the lameness then the palmar process of the distal phalanx, the distal sesamoidean impar ligament, the deep digital flexor tendon, or the joint itself is the cause of the pain. If infusion into the navicular bursa resolves the lameness then primary navicular bone pain or primary bursal pain is the source of the lameness. Radiographs (x-rays) can be useful in helping to diagnose the specific structure causing pain in the foot. Many of the structures in the foot are soft tissue and are not visible on radiographs. Because of lack of visualization of all potential damage, a horse with normal radiographs can have Navicular Syndrome and a horse with apparently abnormal radiographs can be quite sound. Because radiographs do not always correlate with clinical symptoms radiographs are poor predictors of future lameness from Navicular Syndrome such as in a prepurchase examination situation. Radiographs are best utilized to monitor progression of the disease and help the farrier shoe the foot to manage the disease. I will discuss performance shoeing to help manage Navicular Syndrome later in the article. Ultrasound can be used to image part of the collateral ligaments. The downside to ultrasound evaluation is that ultrasound is very limited when it comes to evaluation of the foot. Ultrasound waves simply cannot penetrate the hoof capsule. Endoscopic examination can be used to evaluate the navicular bursa. The downside to endoscopic examination is that it is an invasive procedure and only gives us information about one of the many potential causes of Navicular Syndrome. In recent years magnetic resonate imagining (MRI) has been used to precisely image the structures in the foot. MRI technology has greatly enhanced our knowledge of Navicular Syndrome and our ability to accurately diagnose the source of pain. Using the information gained by MRI we can tailor our treatment for the specific horse. The downside to using MRI is its relative expense and for most MRI units the horse must be placed under general anesthesia to get quality images of the foot. As stated earlier radiographs are not the best predictors of future navicular issues. Buyers however still request “navicular x-rays” before purchasing a horse. In my opinion clinical signs as part of the prepurchase examination is the best predictor of future Navicular Syndrome. If a horse is sound, has no history of foot pain, and has no conformational abnormalities that would predispose him to developing Navicular Syndrome then it is unlikely that he will develop issues in the future. A very reliable way to access conformation that may lead to Navicular Syndrome is to calculate the weight each hoof is bearing in pounds per square inch. The normal horse carries less than 78 lbs/in2 on the front feet. Horses that carry more than 78 lbs/in2 are at increased risk of developing Navicular Syndrome. Horses that carry more than 83 lbs/in2, if they develop foot lameness, almost never make a complete recovery. Some causes of heel pain can be curable other causes can only be managed. Rest can be beneficial to horses with soft tissue injuries but rest is not useful to most horses with navicular bone or navicular bursal pain because when they return to work the lameness soon returns. You can read about how we treated Navicular Syndrome in one patient by going to our Navicular Syndrome Case Study. Care must be taken to correct or preserve foot balance. The hoof-pastern axis should be straight. The break over should be placed 1 cm in front of the coffin bone for a 1000 lb horse. The use of the “four-point trim” or “natural balance trim” are currently popular but to truly achieve the balance required to manage Navicular Syndrome, radiographs are required. The palmar digital angle must be correct to relieve pressure from the deep digital flexor tendon on the navicular bone. Horses raised 6 degrees from flat shoes showed 24% less stress on the navicular bone. However horses whose total angle is raised beyond a straight hoof-pastern axis develop increased lameness due to stress on the coffin bone. Again radiographs are required to maximize this delicate balance. A variety of shoes have been successfully used to manage Navicular Syndrome. I really have no preference which type of shoe the farrier chooses as long as the measurements I produce from the radiographs are followed exactly, the break over is rolled, and the shoe is fit full in the heel. I usually use Equipak to protect the sole, put positive pressure on the frog, and displace force as the foot hits the ground. A wide variety of NSAIDs are used to treat Navicular Syndrome. NSAIDs are rarely used as a stand alone drug to control Navicular Syndrome. NSAIDs are more successful when paired with other management tools. Some clinicians like one NSAID over another, however there are no studies that confirm that one drug is superior for hoof pain. Phenylbutazone is widely used. I prefer Firocoxib due to its lack of side effects. The NSAID of choice is given for 3 to 10 days to treat acute pain and to give other management choices time to work. After the initial treatment period, if necessary, NSAIDs can be used the day before exercise, the day of exercise, and the day after exercise to help alleviate pain. Isoxuprine is a drug that causes peripheral vasodilatation in humans. It has been suggested Navicular Syndrome is due to lack of blood supply to the navicular region. Recent studies suggest that Isoxuprine does not cause increased blood supply to the foot of the horse and that Navicular Syndrome is not caused by lack of blood supply. The fact remains that Isoxuprine does seem to help some horses with Navicular Syndrome. The mode of action may be that Isoxuprine has anti-inflammatory properties or that Isoxuprine is combined with other management strategies. If there is no response to Isoxuprine in 3 weeks I usually discontinue use. Injection of corticosteroids into the coffin joint can relieve pain in horses that experience synovitis or osteoarthritis of the coffin joint and pain associated with the deep digital flexor tendon or the distal sesamoidean impar ligament. The coffin joint communicates with the navicular bone and navicular bursa in 80% of horses. Because of this communication, injection of corticosteroids into the coffin joint can treat horses that experience pain stemming from the navicular bone and the navicular bursa. 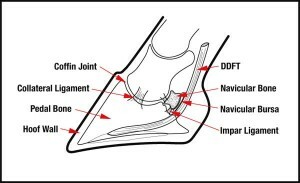 Injection of corticosteroids directly into the navicular bursa can help the 20% of horses that experience pain in the navicular bone or navicular bursa but do not have coffin joints that communicate with the navicular bursa. Temporary resolution of heel pain can be achieved by chemical ablation of the palmar digital nerves. Only horses that travel sound or near sound after the palmar digital nerves are temporarily blocked with mepivacaine are candidates for this treatment. Usually the response to chemical ablation is less than the response seen after diagnostic use of mepivacaine. Many products have been used to cause loss of sensation to the palmar digital nerves. I find Apis mellifera toxin (bee venom) to be the most reliable, least invasive and longest lasting. While bee venom is the most reliable chemical ablation product the results are still variable. Some horses respond well and show no lameness for several months. Some horses do not respond at all. If I get a positive response to the first injection I perform a second injection in 30 days. This protocol gives me the most lasting effects. Extracorporeal shock wave therapy is the process of generating a pulse (not electroshock) wave into the body to facilitate healing. Treating Navicular Syndrome with extracorporeal shock wave therapy is an exciting new use of shock wave. The waves help horses with Navicular Syndrome in two ways. Shock wave helps the injury in the heel of the foot heal faster. Shock wave also gives pain relief to the heel of the foot. Thus shock wave allows the horse to be sound while simultaneously treating the cause of lameness. I usually treat a horse with Navicular Syndrome at least three times with shock wave therapy. I also like to combine shock wave therapy with other forms of treatment such as corrective shoeing or tiludronic acid. Follow link more information on shock wave therapy treatment of Navicular Syndrome, or view our demonstration video. Much of the pain associated with Navicular Syndrome comes from breakdown and resorption of bone (osteolysis). The navicular bone can breakdown and remodel where stress is exerted on the cortical surface. There is also breakdown of the bone where ligaments such as the distal sesamoidean impar ligament and the deep digital flexor tendon attach. Tiludronic acid inhibits painful breakdown of bone. 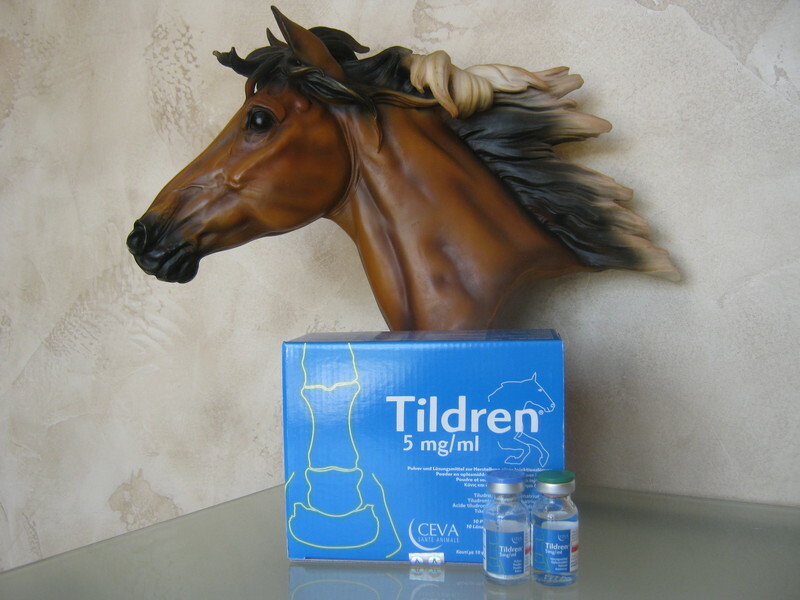 Horses treated with tiludronic acid experience immediate inhibitory effects on bone resorption. The affects last up to 4 months. This means that a lame horse can experience some relief almost immediately after IV administration. Then for 4 months osteolysis is controlled giving the injured area time to heal. Tiludronic acid can be especially effective when the abnormal stress on the bone can be eliminated so that over the 4 months, as the bone heals, it will not be reinjured. Horses with Navicular Syndrome that get corrective shoeing fall into this category. Click link for more information on Tiludronic acid. Desmotomy of the collateral ligaments of the navicular bone is a technique that is designed to relieve stress on the navicular bone. The ligaments of the navicular are actually surgically cut thus relieving tension to this area. The advantage to this surgery is that the horse retains feeling in the foot. The disadvantage is that there is a prolonged recovery time and that some horses only remain pain free for 1 to 3 years. Palmar digital neurectomy is the technique of surgically cutting the nerves that innervate the navicular region. Once those nerves are cut the horse no longer has feeling in the back half of the foot so is then completely sound. Unfortunately neurectomy does not always work that easily. Only horses that respond completely to a diagnostic palmar digital nerve block are candidates for this surgery. Of those horses only 70% respond to palmar digital neurotomy. For horses that do respond, the length of time that they will stay pain free is quite variable. 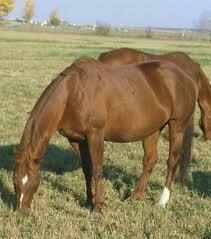 Some horses stay pain free for several months while others stay pain free for several years. The most important thing you can do to prevent Navicular Syndrome in your horse is to be sure he has proper shoeing. This can mean more than just using a quality farrier. The use of performance radiographs to maximize the balance in the foot is very important to get optimal performance and to prevent Navicular Syndrome. Trying to limit the lbs/in2 on your horse’s front feet is also important. There is little you can do about the size of your horse’s feet but you can control his weight. Many show horses are overweight; as this may present a pleasing picture in the ring it is not good for their limbs. Human athletes are slimmer than the general public, I believe equine athletes should follow suit. If your horse carries more than 78 lbs/in2 on the front feet, you should use weight control and performance radiographs to help prevent Navicular Syndrome. If you have a lame horse that you suspect may have Navicular Syndrome, or you simply want to do everything possible to prevent Navicular Syndrome, call Conley and Koontz equine Hospital at 877-499-9909. We can help.